Photo: Karathona Bay Left Sector, Gallida 7c? takes the right hand butress and wall. Season. Nearly all year, maybe not summer. Karathona Bay is a large bay just south of Naplion. The ruins of a half built holiday village will be seen but don´t intrude on the climbing, which is surprisingly good and with the recent re-bolting of the older routes this is a worthwhile venue with routes for everyman. Nice easy walk, good bathing, beach bar etc, typical "Greece by the sea" climbing with the routes being just out of tourist range. Good anchorage for sailing climbers. Some changes here due to a re-bolting session.Route numbers as in the guide. 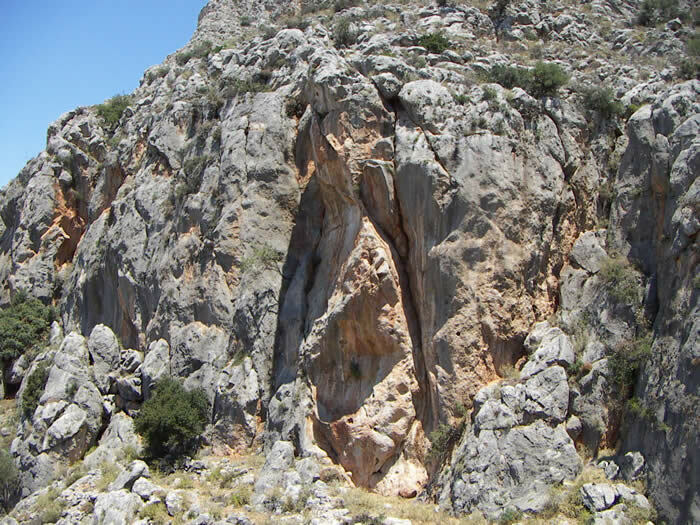 Route 15 (No Name) in the guide is now Hercules 6a+ ** Rebolted. Route 14- Tasos is now 5c+ 25m ** Rebolted. Route 13-(No Name) is now Shismi- 5c **(A. Antonopoulos). Route 12- Gallida 7c? 25m *** Re-bolted. Route 9- Iokaste- 4b 15m ** Bolted. Route 8-Ismine- 5a+ 15m ** Bolted. There is a new route (No Name 7b?) between R 2 Agamenon and R3 Oktana.